Infinite Art Tournament: The Songs of the Fifty States: Missouri! The Running Avatar started 2015 in Eastern Colorado, crossed into Nebraska on the last day of January, and entered Kansas on the first day of February. Since then, it has been a long traverse across the rural immensities of the Sunflower State. 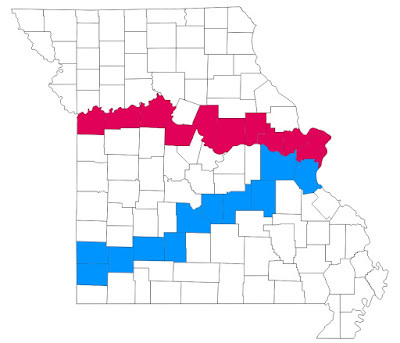 Only yesterday, some 630 miles later, did my insubstantial alter ego cross State Line Road and find himself in Missouri. Not long after, he came trotting up to the entrance of the Nelson-Atkins Museum of Art. 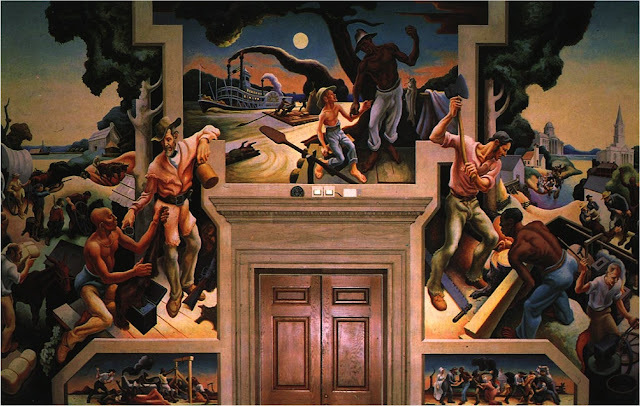 Thomas Hart Benton, A Social History of the State of Missouri. State Capital Building, Jefferson City. Art Mecca: I didn't really know much about art until -- well, let's be honest. I still don't really know much about art. But I really, really didn't know much about art until I was around thirty. Sometime around there, a friend -- I'm not sure which friend -- suggested we go to nearby Kansas City, Missouri, and visit the Nelson-Atkins Museum of Art. I didn't really expect much, but since the central area of the United States is not exactly brimming over with tourist destinations, I gave it a go. And I was enchanted. I remember two pieces especially well. One was a big ol' Monet. Now, keep in mind that I am by upbringing a village lad when I say that I boggled, really boggled, that I was in the same room with, not a reproduction, but an actual Monet! Imagine me stretching the word "golly" over several seconds, and you won't be far off. I stood on the other side of the room from it. I got right up on top of it, sticking my face a couple of inches from it. I was all, like, "so that's what impressionism is! Golly!" The other was an ivory carving of the Fall of the Rebel Angels, the intricacy of which amazed me, and amazes me still. I thought that the Nelson Atkins must be the coolest museum in the world, and I suppose for me, at the time, it was. I went back several times before I moved away from Kansas. I wonder if I'd still love it now that I've seen a lot more museums, or if I'd be all jaded. Have Admired the Visual Arts In: Yes. Have Slept Overnight In: Yes. 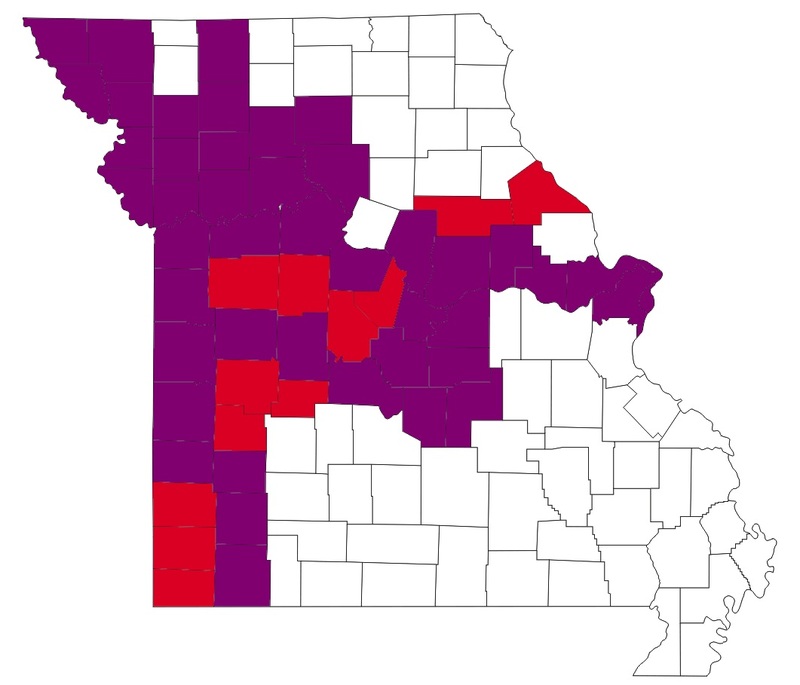 A side trip to Missouri in the foreseeable future is possible but not likely. St. Louis also has a lovely art museum, and it's free, too. Oddly,I was unimpressed with the St. Louis museum when I visited it in 1999. I don't really trust 1999m5k's judgment, but at the time it seemed like they were playing in different leagues.